This beautiful Vacation Villa comes with multiple upgrades and enough space for the entire family, come home to an open concept floor plan loaded with amenities inside and out. 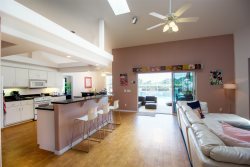 You will find that the living room is perfect for any family to relax and enjoy after a long day in the sun, the living room comes complete with a 42 Inch TV, Internet access, and Cable TV. Adjacent to the Living room you will find the dining room which has seating for 8 guests. This Van Der Valk Vacation Home comes with a fully equipped kitchen which is perfect for entertaining whether a gourmet chef or just a home cook trying to put dinner on the table after a long day exploring Citrus County, this open concept kitchen has all you could need from pots and pans to upgrades such as appliances and amply countertops. Curious as to what is going on in the kitchen? Take a seat at one of the bar stools where you will get a perfect view of the action in the kitchen. This vacation rental is also the perfect place to relax and get a restful night’s sleep in one of the four bedrooms. The master bedroom is located at the east side of the living room and comes with a queen sized bed dressed in luxurious bedding an en-suite bathroom and a flat screen TV, the next bedroom has a queen sized bed with a flat screen TV and a shared Bath the third bedroom has a queen sized bed and a shared bath. The fourth bedroom has 2 twin beds and share the bathroom. Very friendly. Straightforward with answers/information. Gave the impression of genuinely wanting us to have a good time.